An infantile attempt by the Chicago machine to give the middle finger to President Trump, the installation instead broadcasts the priorities of the Democrat city officials, who selected both the sculpture and its location. 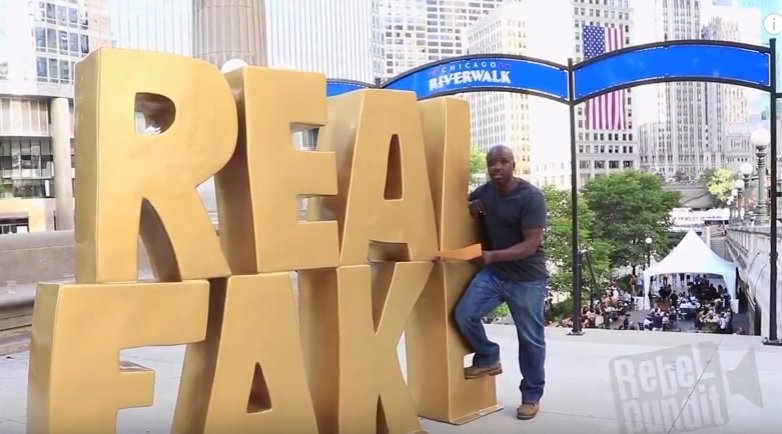 While the #RealFake sculpture has served as a convenient gathering point for anti-Trump selfies, Antifa and Socialist marches, and tourist group photos flipping off the Trump Tower sign, not all residents found the city’s move “cute,” as documented in “Chicago Carnage. The irony of the city spending money to install Trump hate while their neighborhoods are overrun with real poverty, drugs, and murder, is personal for these community organizers. In the film, both McKinley and fellow organizer Carter blast the “social engineering” of the “liberal agenda,” evident within a few short miles of the infantile sculpture. “There is nothing fake about this guy [President Trump],” said Carter, “he tells you what he’s about. The fake is Barack Obama, the fake is Bill Clinton….They want you to believe that there is some white racist Republicans or some white racist conservative doing this. No, this is the Democrat machine; these are white and black racist Democrats that are doing this to us. RebelPundit.com’s Jeremy Segal and Andrew Marcus are documentary filmmakers who report nationwide from the epicenter of the Belly of the Beast, Chicago. They specialize in in-depth coverage of mass revolutionary movements and are available to comment on their recent coverage of events surrounding the #RealFake sculpture as well as general mass-movement tactics, organization, and violence.